To celebrate, we’re practically giving away our Article Template Packages. Use the following coupon code in the EzineArticles Shop to receive $14 off your entire Article Template purchase. * That means you can get an entire Build-Your-Own Article Template package for just $0.97! P.S. : If you liked this deal, just wait until you see our Cyber Monday promotion! Keep an eye on the EzineArticles Blog for more awesome deals. 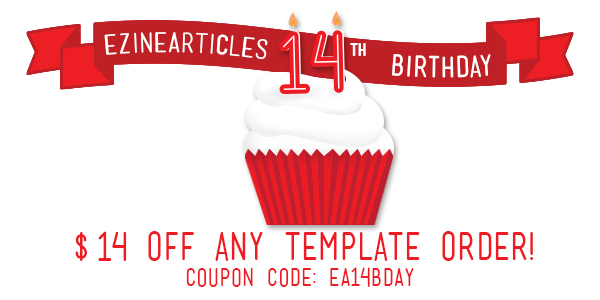 Happy birth EzineArticles and thanks for the $14.00 off every template of our choice. Thanks. This will be a great help! Save me much time! Thanks for the gift! Just had my birthday too…69! but young! yes, Great happy birth day EzineArticles..
Hi EzineArticles, great newsletter and info. Pity I missed the Article Packages Offer. I was offline in the UK when the e-mail arrived Sent:19 November 2013 17:49:32. I hope we will get other offers in the future. Thanks. Regards, Ronald. congratulations EzinleArticles for celebrating the grand success. We share the same feeling and success as the writer. Have You Great Happy Birth Day.